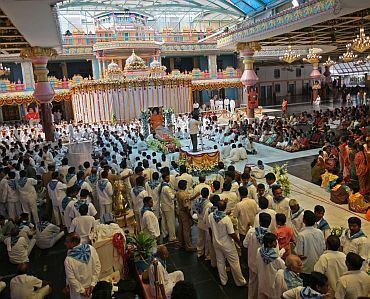 Going by the rush of devotees and also the number of VVIPs thronging to catch a glimpse of the late Sathya Sai Baba, the administration has decided to extend the time of darshan till midnight. The burial of the body will, however, take place between 9:00 am and 9:30 am on Wednesday, as per Hindu rites. 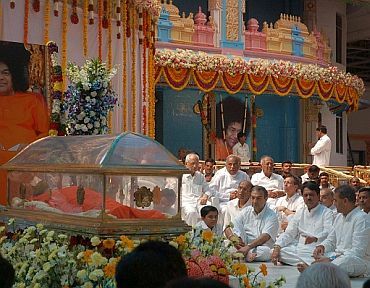 The last rites of Sathya Sai Baba will be a private affair; no devotees will be allowed to witness it. 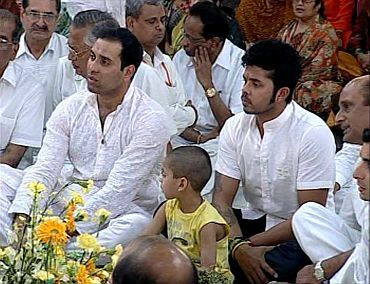 Earlier, there was confusion whether the spiritual leader will be buried at the Yajur Nilayam or the Sai Kulwant hall. However, after consultation with experts, including those who are well versed with Vaastu, it was decided that the funeral will be held at the Sai Kulwant hall. Sathya Sai Baba will be buried at the exact spot from where he used to give darshan to his devotees. A mausoleum will be erected at the same place following the burial. Experts have been consulted regarding this place and they too have approved the exact same place. 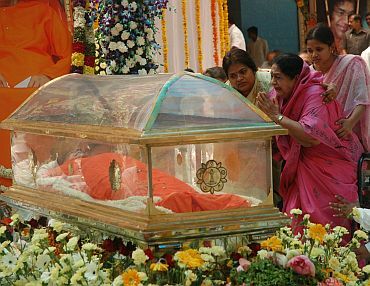 It may be a while before the devotees get to see the samadhi of Sathya Sai Baba, which will have on it engraved -- manava seve madava seva (service to man is service to god). The digging process at the burial site will commence soon at the Sai Kulwant Hall. Holy water and soil from river beds across the country is being brought down to Puttaparthi. This would be used when the spiritual leader's body is buried. Currently, the area where Sathya Sai Baba will be buried has been covered completely with a white cloth. It would be opened up at a later date for devotees once the formalities involved with the burial are complete. The Sai Kulwant hall will remain shut all through the day and there will be no activity on Wednesday. However, proceedings such as bhajan sessions will resume on Thursday onwards, officials in Puttaparthi say. Meanwhile, the outpouring of grief continued on Tuesday too. Devotees continue to wait in long lines to get a final glimpse of their swami and despite the scorching sun beating down at 40 degrees centigrade, the devotees seem undeterred. Scores of special buses and trains have been arranged to bring in the devotees and till date the official count indicates that over a lakh devotees have arrived in Puttaparthi to pay homage to their God. Who says Sathya Sai Baba's prophecy was wrong?